PRODUCT ALERT: Quantitative and Qualitative Detection and Determination of Azides are now avaliable. Chemsee has developed several unique types of products for the detection, determination and decontamination of azides. These products have been designed to meet the specific demands of the end user. Qualitative Azide Detectors. These detectors allow a user to know instantly if a solution contains azides. Detectors are avlaible for both Neutral and Basic solutions. More information can be found here. Quantitative Determination System for Azides. 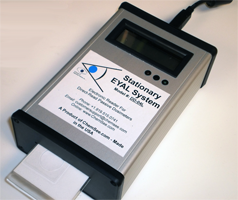 This system uses disposable QuantTab™ Azide cards and an electronic reader that can be hooked to any windows based computer to quantitatively measure the concentration of azides in a solution. The provided software quantifies the color formed, displays the azide concentration and saves a record of the results for each sample for tracking and fruther evaluation. More information can be found here. Azide Decontamination Solutions. ChemSee has developed a decontamination process to safely neutralize Azides in a solutions so that they can be disposed of in normal wastewater. More information can be found here. Ideal for Instant Testing for Azides in process and waste streams. Can be used by a laymen with minimal training. Obtain Instantly the Concentration of Azides. Quantitative Detection range of 10 ppm – 250 ppm in neutral pH conditions. Sample preparation pouches for alkaline samples are avaliable upon request.